The government's chief drugs adviser has strongly indicated the Advisory Council on the Misuse of Drugs (ACMD) will recommend mephedrone be banned. Professor Les Iversen said he expected the panel would make a recommendation to the home secretary next Monday. He said he believed mephedrone was "harmful" and hinted that it should be categorised as a Class B drug. His evidence to an MPs' committee comes as the deaths of a number of young people have been linked to the drug. 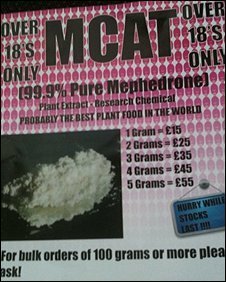 The drug is known by various names, including "M-Cat", "MC", "mieow", "meow", "4MMC", or simply plant fertiliser. Concern over its effects has grown after two friends, Louis Wainwright, 18, and Nicholas Smith, 19, died in Scunthorpe, Lincolnshire, last week after taking mephedrone. 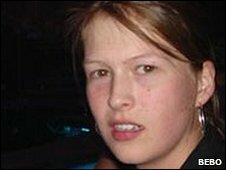 Since then a number of other deaths have been investigated to see if they are connected to the drug, including that of 24-year-old Lois Waters, who died in Norton, in North Yorkshire, on Monday. Her family paid tribute to her as "a really lovely girl". The police are awaiting the results of toxicology tests to see if mephedrone played a role in her death. The drug is usually a white or yellowish powder, which is snorted, but it can also be obtained in pills and capsules. It is marketed as a plant food. The professor told the Home Affairs Select Committee it was his personal view as a pharmacologist that mephedrone and other related drugs were "amphetamines by another name". Often sold online as plant food marked "not for human consumption"
How has drug affected users? What is legal high mephedrone? Amphetamines are currently classified as Class B drugs and possession can carry a jail term of up to five years or an unlimited fine or even both, while dealing can result in a prison term of up to 14 years. Prof Iversen said an interim "temporary" ban while the council considered the evidence would not be effective. He also said that if the ACMD did recommend a ban it would recommend "a generic scope that will cover all derivatives of mephedrone - either those made now or those that could be made in the future". Prof Iversen said it would be a "tragedy" if anyone else died as a result of taking mephedrone before the ACMD issued its report. He said a plan by Liverpool John Moores University to use students as guinea pigs in a research experiment on the drug was "pretty unethical". Psychologists at the university have recruited 50 students for a study into the effects of mephedrone. Committee chairman, Keith Vaz MP, said members would write a letter of complaint to the home secretary about the delay in implementing a ban. "We just think the delay is most unsatisfactory given the dangers that are inherent [in taking mephedrone]," he said. Opposition ministers have also criticised the length of time it has taken for a review of the drug to take place, although websites selling the drug have told their customers it is a case of "when" not "if" mephedrone will be banned. Prof Iversen admitted there was a "temporary hiatus" in the ACMD's review of mephedrone following the dismissal of Professor David Nutt last year and the resignations of other ACMD members over government policy on cannabis. Prof Iversen also revealed that last year he too had been "on the verge" of resigning as a member of the ACMD with a "number of colleagues" - because the relationship between the ACMD and Home Secretary Alan Johnson had deteriorated. However, he said was satisfied with the current relationship, and said he was "confident" the body's independence would be fully safeguarded. He told the committee there had been a rise in middle-class cocaine use but warned: "This is one of the most addictive substances known to man and it's certainly not safe and the risk of death from overdose is certainly there." How has mephedrone affected users?